Editor’s Note: This article was originally published in Overland Journal, Summer 2013. 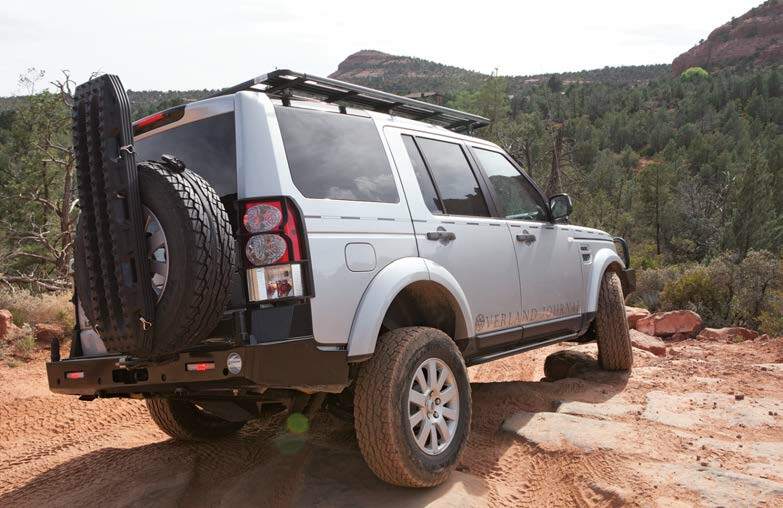 In factory form, the Land Rover LR4 is impressive in the dirt. 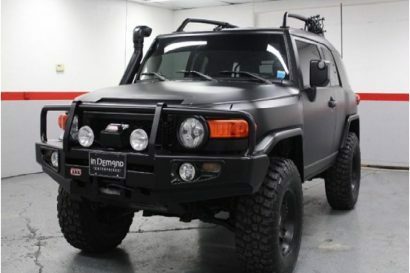 As with all stock vehicles though, there are compromises. 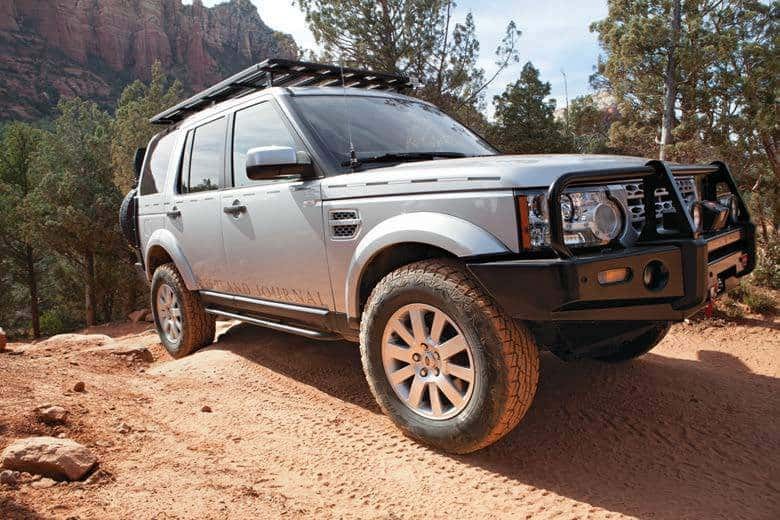 Land Rover is self-described as “The Best 4x4xFar,” and the LR4 comes equipped with enviable hardware to help support that claim. A few key features include a highly effective Terrain Response system, adjustable-height air suspension, and excellent visibility. 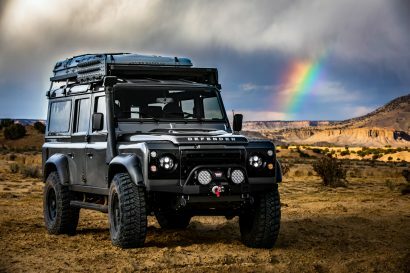 For this second installment of our Modern Explorer project vehicle, we’ll be addressing two primary constraints to the long-distance overland suitability of the LR4 platform. The first is the fitment of a 33-inch, light truck, all-terrain tire on an 18-inch factory LR3 wheel. The second is to increase the running ground clearance. 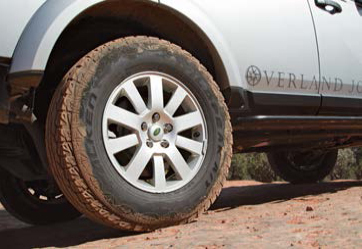 While a 19-or 20-inch wheel can look beautiful on a road-going vehicle, a vehicle used for extended overland travel needs suitable tires: tires with an appropriate tread design, sufficient sidewall height, and robust construction. 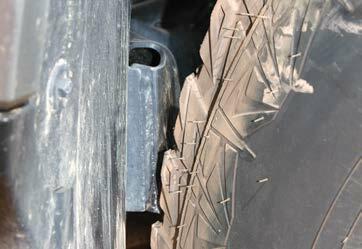 Tire damage is the most frequent mechanical issue on any vehicle, with the chance of a puncture increasing significantly once we leave the pavement. From the factory, the LR4 is equipped with 19-inch wheels and 255/60R19 Continental all-season tires. While the diameter is nearly 30 inches, it is the 4-inch sidewall height, mild tread design, and passenger car construction that render this combination a liability for serious off-pavement travel. If we could perform only one modification to the LR4’s stock form, it would be the option of an 18-inch wheel and proper LT rated all-terrain tire. So, why does the LR4 come equipped with a 19-inch wheel? 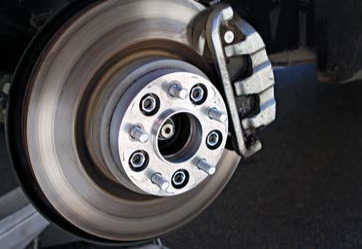 Modern vehicles, particularly heavy, luxury SUVs, are fitted from the factory with massive brakes. With each new model, brake rotor diameter, caliper size, and the number of pistons tends to increase. Brake rotor diameter on the LR4 is 14.2 inches (360 millimeters), making it difficult to fit an 18-inch wheel. These massive brakes have inherent advantages: reduced stopping distance, reduced fade in extended braking, improved modulation control, and increased service life. However, even an 18-inch wheel is at the upper limits of what we see as suitable for a proper 4WD. The reason, again, comes to sidewall height. The larger wheel restricts the lower threshold of operational tire pressure, limiting the carcass’ ability to wrap around rocks, roots, and surface irregularities, thus reducing contact with the terrain. The effect is decreased traction. The lower profile sidewall also increases the potential for pinch flats and wheel damage. The remaining negative impact is reduced flotation, which is particularly important when traversing mud, snow, and sand. Lower tire pressures increase the total contact area, reducing vertical load forces (measured in pounds per square inch), on the surface, allowing the vehicle to “float” rather than dig in and sink. In short, tire pressure affects performance and ride comfort, and wheel diameter can have either a positive or negative impact. Considering these off-pavement benefits, we researched available solutions. Currently, the only 18-inch wheel that will fit the LR4 with no modification is the Compomotive PD1880 from the UK. The combination of wheel shape and offset allowed them to just barely fit over the LR4’s calipers. This is a good solution and a nice-looking wheel, particularly in black. However, they’re currently only available in the UK or from Fifteen52 in the US and cost a little over $400 each. We elected to investigate the option of fitting a factory LR3 wheel, and sourced a set from Land Rover Las Vegas. 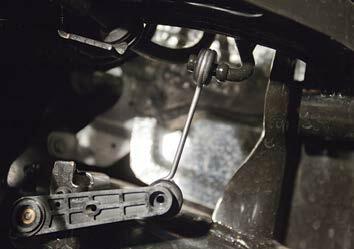 This can be done in several ways, the most expensive being the installation of smaller calipers and rotors. This allows for a 17-inch wheel and is a common solution in Saudi Arabia where massive sand seas require maximum flotation. The second, and not advisable solution (unless you are a mechanical engineer and willing to assume all responsibility), is to grind the caliper to allow the wheel to fit. A small amount, removing casting flash for example, may be okay, but to fit the LR3 18s, lots of grinding would be required. We made this work but ultimately abandoned the idea. The final option, and the one we believe provides the best overall performance, was to install 30-millimeter wheel spacers from Motorsports Technology. While wheel spacers do have issues, there are high-quality manufacturers offering hub-centric options needed for the LR4. Wheel spacers do require periodic inspection to ensure safe use, but when installed and torqued correctly, they are a viable solution. Though there were just a few millimeters to spare, the LR3 wheels slipped right on. 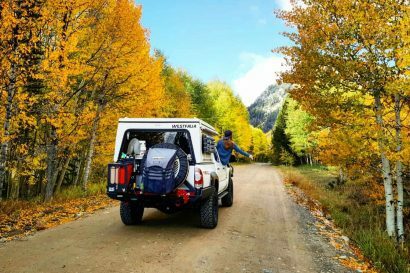 With the 18-inch factory Land Rover wheels installed, we now had a huge selection of tires available, as well as tread patterns ranging from mild to wild. Given that this is such a luxurious vehicle to drive on the road, encouraging long-distance road trips, we elected to use an all-terrain tire. We chose the Falken WildPeak 33×10.5 (265/70 R18), a large diameter but narrow tire with a reputation for exceptional puncture resistance. The tires fit, just barely, rubbing the rear fender liner and the front frame member slightly. We’re working on a few long-term fixes to these items and will report back on the best solution. In a word, the new tires transformed the LR4, providing an increase of 1.5 inches of ground clearance over stock and a significant increase in sidewall height. We can now run 20 psi on most trails and as low as 14 psi (1 bar) in soft sand, greatly increasing traction and flotation. With more sidewall available to conform to the terrain, ride quality on the trail has also improved. Lastly, the LR4, after shedding its remaining vestiges of boulevard bias, has taken on a more trail-worthy appearance. With the tires installed, it was time to address running ground clearance. For this, we adjusted the factory air suspension using two tools, one mechanical and the other software based. The LR4 has a four-corner, long-travel, cross-linked air suspension and is without question the most effective suspension of its type. When the vehicle navigates through uneven terrain, the airbag being compressed at one wheel forces air into the opposite side airbag. This results in remarkable wheel travel for an IFS/IRS vehicle and keeps the vehicle level and stable. The first modification was the installation of new suspension height sensor arms from Johnson Rods. These arms install in a matter of minutes per corner and “trick” the suspension ECU into thinking the vehicle is lower than it really is. This results in a 2.25-inch increase in ride height. Given that this is an independent suspension SUV, the total range of travel is effectively set in the design. This means that for every inch of increased ride height, we must take away one inch of suspension extension. Because the LR4 has long travel suspension, the vehicle tolerates this approach quite well, but there are limits. The Johnson Rods are a quick fit, but lack the ultimate control we wanted over the suspension settings—enter GAP Diagnostics. For additional fine-tuning, we sourced an IIDTool from GAP Diagnostics. 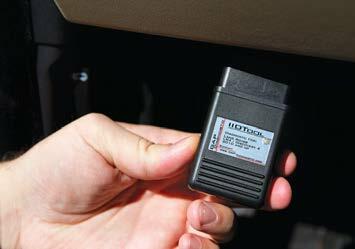 This unit plugs directly into the OBD-II (On Board Diagnostics) port and allows access to several of the 13 onboard ECUs. It utilizes the factory display and steering wheel controls to manage hundreds of functions; everything from suspension height changes to reading fault codes to changing the Tire Pressure Monitoring System (TPMS). Very cool. The process involved sitting in the vehicle as it idled in park, releasing the parking brake, and becoming the new mastermind of the ultimate gadget. Within 10 minutes I had turned off the TPMS, added 10 millimeters of height to the rear, changed the auto locks, and stopped the mirrors from automatically retracting when the doors are locked— brilliant! Of course, great power comes with great responsibility. I logged all changes to the system and will be sure to wield my new powers with some care. While fine-tuning the suspension height, we found the limit to how much the vehicle can be lifted. We discovered that the 2.25 inches provided by the Johnson Rods, combined with the additional 10 millimeters acquired with the IIDTool, was the most reliable height setting. This provided good ride quality on the road, but never gave any faults or issues when selecting Off-Road mode in the Terrain Response system. I had initially set the truck to plus 10 millimeters in the front and plus 20 millimeters in the rear (over the Johnson Rods adjustment). This worked on level ground, but on the trail, the height sensor indicated an “out of range” warning. This was, of course, easily remedied with a short session with the IIDTool. Given our experience, the additional 70 millimeters (2.8 inches) of height seems to be the reliable limit (60 millimeters (2.4 inches) in the front. Perfecto. At this point in the project, I cannot be more pleased with overall performance. Sure, the LR4 is not an extreme rock crawler, but we didn’t want it to be. With 18-inch factory wheels, 33-inch tires, and nearly 13 inches of available ground clearance, what we now have is an extremely capable exploration vehicle with all the comforts and power of a luxury sedan. The improvement in clearance, traction, and overall trail performance is astonishing, and I have not noticed a single notable compromise to road comfort. With the LR4’s massive brakes, and an engine that produces nearly 400 horsepower, the change in tire diameter has also had little effect on performance. Additionally, fuel economy has reduced by only one mile per gallon. Thus far, these modifications have all exceeded my expectations, and lead the way to our final phase of the project: addressing cargo storage and sleeping inside the vehicle. With that, it’s time to wrap up this segment and go plug the IIDTool back in—I wonder what that “custom functions” menu will let me try.